Six days before the Passover, Jesus came to Bethany where Lazarus was, the one Jesus had raised from the dead. So they gave a dinner for him there; Martha was serving them, and Lazarus was one of those reclining at the table with him. 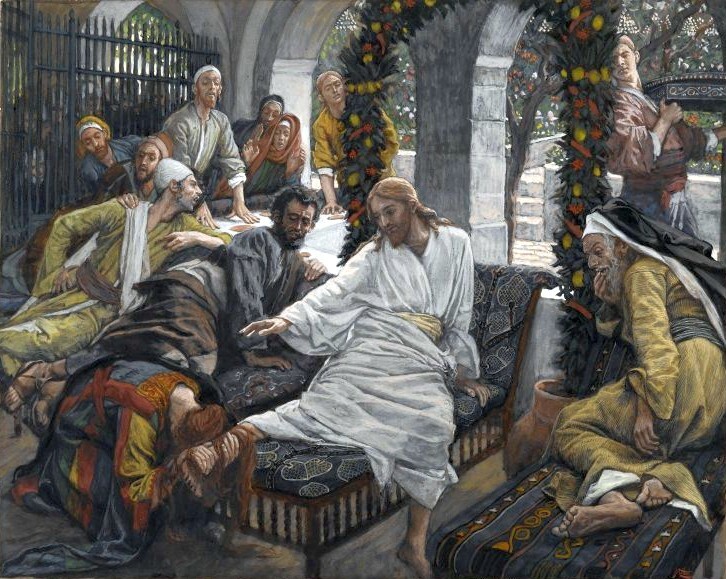 Then Mary took a pound of perfume, pure and expensive nard, anointed Jesus’s feet, and wiped his feet with her hair. So the house was filled with the fragrance of the perfume. Then one of his disciples, Judas Iscariot (who was about to betray him), said, “Why wasn’t this perfume sold for three hundred denarii and given to the poor?” He didn’t say this because he cared about the poor but because he was a thief. He was in charge of the money-bag and would steal part of what was put in it. For example, "say I work eight hours a day and after taxes, make $10 an hour, meaning I'm earning $80 a day. I want to go out for a nice dinner on Friday and that costs about $80, meaning I spent an entire day of my life working for this meal. And then you start thinking about even larger purchases, like a $1,000 TV, and you think, 'How much of my life did I trade for this? Is it worth it?'" Myth #1: Arminian Theology is the Opposite of Calvinist/Reformed Theology. Reality: Arminian and Calvinists have much in common. In this regard, let me add my own comments that Arminian theology affirms the basic historic creeds of Christendom. One wonders how in the world that Arminius would have gained the staunch Calvinist Beza's support and have been called as pastor and university professor at Leiden by the Dutch Reformed Churches if he didn't share basic theology with his Calvinist colleagues. The common ground between Arminians and Calvinists will become more obvious as the subsequent myths are debunked. Myth #2: A Hybrid of Calvinism and Arminianism Is Possible. In this chapter, Olson shows how "Calminianism" is illogical. Myth #3: Arminianism Is Not an Orthodox Evangelical Option. In this chapter, Olson examines how mainstream Calvinists label Arminianism as either barely Christian or fully heretical. He then looks at the basic beliefs of Evangelicalism and shows how Arminianism affirms basic doctrines such as Divine Revelation, the Trinity, salvation by grace through faith, etc. I suppose this chapter could have been combined with Myth #1. Myth #4: The Heart of Arminianism Is Belief in Free Will. In reality, Arminians are not driven to their position because they want to cling to free will, as if it were absolutely precious and the one non-negotiable of the debate. The real issue for Arminians is the character of God. Arminians are driven to their position because they see that Calvinism leads to making God the author and the effecting power of sin, and denying God's goodness. Myth #5: Arminian Theology Denies the Sovereignty of God. Reality: Arminians view the Sovereignty of God differently than Calvinists, but they still affirm it. Arminians are amazed that Calvinist definitions of Sovereignty seem to imply an absolute determinism which logically leads to God being the author of sin. Myth #6: Arminianism is a Human-Centered Theology. In refuting this myth, Olson discusses Arminius' pessimistic anthropology and how his view of Total Depravity continues in a trajectory down to our contemporary Arminian theologians. Myth #7: Arminianism Is Not a Theology of Grace. This chapter exposes how Calvinists depict the particulars of their system as the exclusive domain of the biblical doctrines of grace. Olson goes on to explain how Arminian theology fully denies a salvation by works, and how God's grace brings a person to faith, and hence, to salvation. Myth #8: Arminians Do Not Believe in Predestination. Reality: Arminians do affirm predestination, but they are unwilling to allow Calvinists to define the term. Arminian predestination is defined along the lines set forth by Arminius: "[Predestination] is an eternal and gracious decree of God in Christ, by which He determines to justify and adopt believers, and to endow them with life eternal, but to condemn unbelievers and impenitent persons." Olson explains that Arminian view of election is grounded "in Christ," and that the way in which Calvinists ground election in the divine decrees makes election insufficiently christocentric. Olson includes in this chapter a discussion of Open Theism and Middle Knowledge. Myth #9: Arminian Theology Denies Justification by Grace Alone through Faith Alone. Calvinists are quick to assign what they think are the necessary implications of Arminian theology to Arminianism; thus the charge Arminians with adherence to a works-based salvation. This is somewhat akin to Myth #7 (Arminianism Is Not a Theology of Grace), but focuses on the issue of justification and imputed righteousness. Olson shows how Arminian theologians consistently emphasize justification through faith apart from works. I might add that since Arminians believe salvation is by grace through faith, they cannot simultaneously think that salvation is by works: if salvation is through faith, then it cannot be by works. Myth #10: All Arminians Believe in the Governmental Theory of the Atonement. The question is whether or not Jesus actually "paid" our sin-debt on the cross, or if Jesus' death had some other divine meaning to it. In this case, Calvinists have managed to define the Arminian view of the atonement by pointing to exceptions in the Arminian trajectory, rather than by Arminius and the majority of Arminian theologians who do affirm the Penal Satisfaction View of the Atonement.